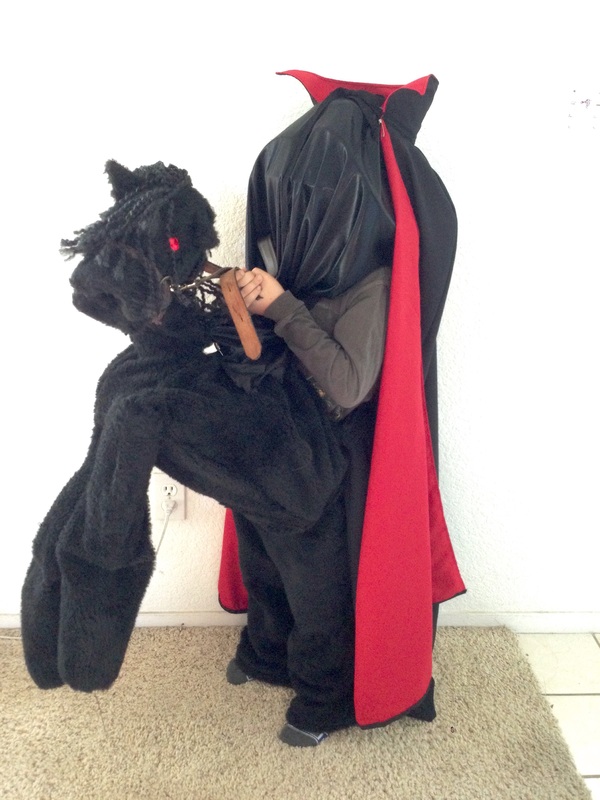 - Don Raye and Gene de Paul, "The Headless Horseman"
So my son wanted to be the Headless Horseman this year. First off, I must state that I thought this was a pretty awesome costume idea from my eight-year old. I was expecting to hear something from Pokemon or Minecraft, based on the popularity of those particular worlds around the house. Washington Irving, though... That's fun and very classic Halloween. The horse stretched my brain a bit though and I warned the kid upfront that I was going to do my best on this one but not to get his expectations set on a photo-realistic spectral horse that would strike fear into the hearts of men. With that in mind, we set off. The headless part, as predicted was pretty easy. We took a trip to the fabric store, where the kiddo looked at cape fabric and determined that this one was too shiny, that one was not shiny enough, and this one was just right. The only addition to a standard lined cape was an additional sheet of black semi-sheer fabric anchored into the collar seam along the back to hide the superfluous head. Picking this fabric was relatively easy. We stood in front of a rack of black fabric, while I held each up in turn. "Yes, can you see me?" I took a cheap black hat and anchored to it a couple of black sun visors, each twisted 90 degrees to opposing sides, to give the impression of shoulders, and then pinned the cape to the hat. Voila. Headless. The horse's rear end (stop laughing) was purely a pair of pants made of fake fur with a black yarn tail for the kid. I sliced a pair of thrift-shopped black pants in half and hung the empty legs from the waist to make the bottom half of the rider. (The pockets are still functional. This was the source of much unexpected glee.) The body of the horse is various flotsam from around the house (namely: an old springy toy holder, a couple of pool noodles, and an empty oatmeal container) covered in fur-like fabric. The whole thing is held together with a few stitches, a copious amount of hot glue, and the mutterings, pleas, and threats of a late-night seamstress. The result is vaguely horseshaped, but the kid is pleased, and I think it will hold through the big night. That's genius! As a child who expected quite high levels of realism, I would have been thrilled with that. You both deserve big gold stars!